Long arms of hot gas been discovered in the Coma cluster of galaxies. 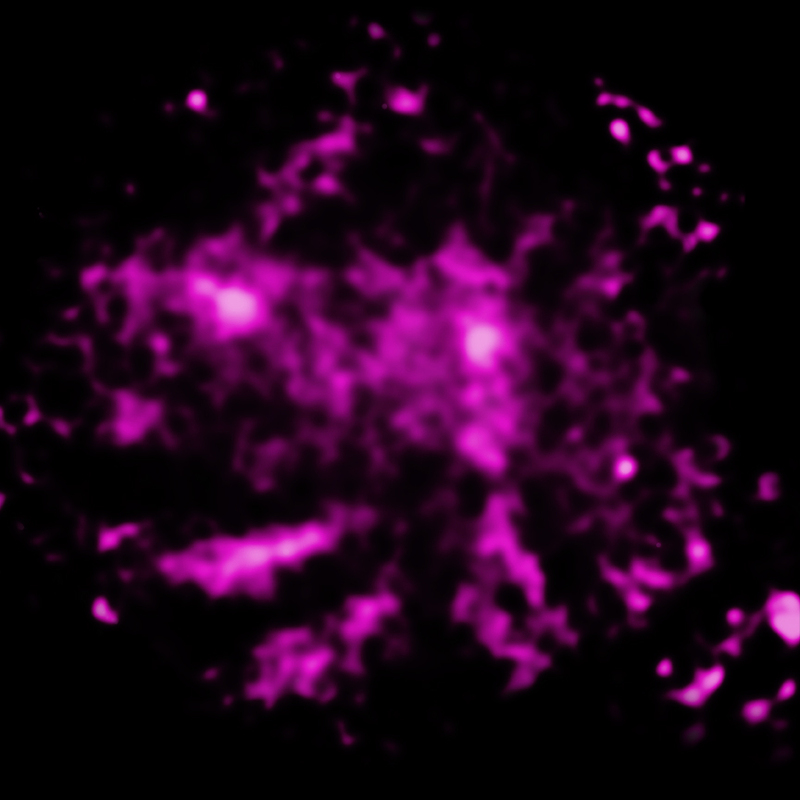 These arms were likely formed by hot gas being stripped and left behind smaller clusters of galaxies as they merged with Coma. These arms span at least a half a million light years. Galaxies clusters are the largest structures in the Universe held together by gravity. A team of astronomers has discovered enormous arms of hot gas in the Coma cluster of galaxies by using NASA's Chandra X-ray Observatory and ESA's XMM-Newton. These features, which span at least half a million light years, provide insight into how the Coma cluster has grown through mergers of smaller groups and clusters of galaxies to become one of the largest structures in the Universe held together by gravity. A new composite image, with Chandra data in pink and optical data from the Sloan Digital Sky Survey appearing in white and blue, features these spectacular arms (mouse over the image for their location). In this image, the Chandra data have been processed so extra detail can be seen. The X-ray emission is from multimillion-degree gas and the optical data shows galaxies in the Coma Cluster, which contain only about 1/6 the mass in hot gas. Only the brightest X-ray emission is shown here, to emphasize the arms, but the hot gas is present over the entire field of view. Researchers think that these arms were most likely formed when smaller galaxy clusters had their gas stripped away by the head wind created by the motion of the cluster through the hot gas, in much the same way that the headwind created by a roller coaster blows the hats off riders. Coma is an unusual galaxy cluster because it contains not one, but two giant elliptical galaxies near its center. These two giant elliptical galaxies are probably the vestiges from each of the two largest clusters that merged with Coma in the past. The researchers also uncovered other signs of past collisions and mergers in the data. From their length, and the speed of sound in the hot gas (~4 million km/hr), the newly discovered X-ray arms are estimated to be about 300 million years old, and they appear to have a rather smooth shape. This gives researchers some clues about the conditions of the hot gas in Coma. Most theoretical models expect that mergers between clusters like those in Coma will produce strong turbulence, like ocean water that has been churned by many passing ships. Instead, the smooth shape of these lengthy arms points to a rather calm setting for the hot gas in the Coma cluster, even after many mergers. Large-scale magnetic fields are likely responsible for the small amount of turbulence that is present in Coma. Estimating the amount of turbulence in a galaxy cluster has been a challenging problem for astrophysicists. Researchers have found a range of answers, some of them conflicting, and so observations of other clusters are needed. 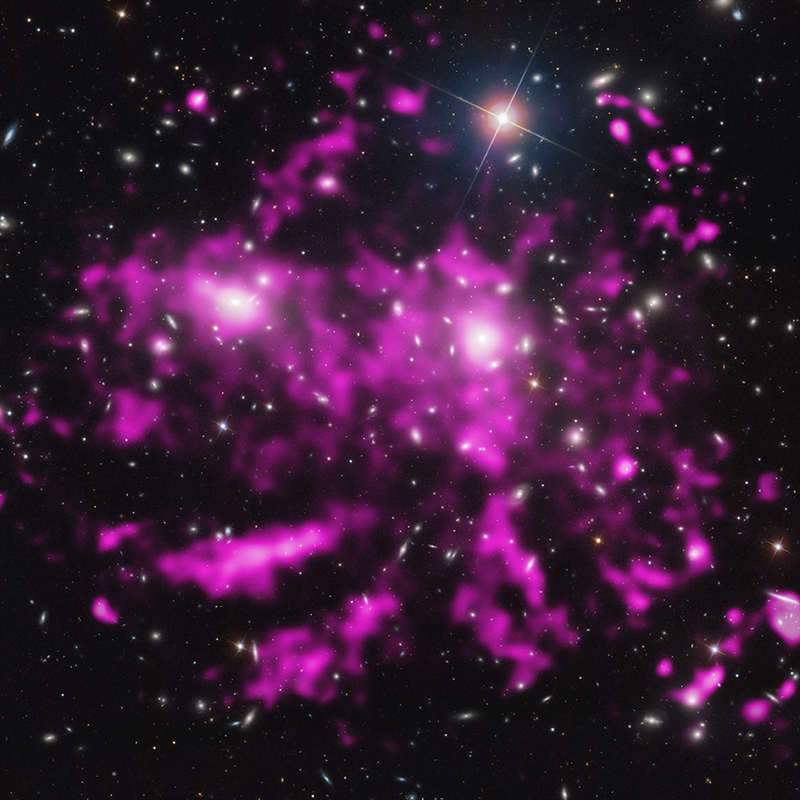 Two of the arms appear to be connected to a group of galaxies located about two million light years from the center of Coma. One or both of these arms connects to a larger structure seen in the XMM-Newton data, and spans a distance or at least 1.5 million light years. A very thin tail also appears behind one of the galaxies in Coma. This is probably evidence of gas being stripped from a single galaxy, in addition to the groups or clusters that have merged there. These new results on the Coma cluster, which incorporate over six days worth of Chandra observing time, are available online will appear in the September 20, 2013, issue of the journal Science. The first author of the paper is Jeremy Sanders from the Max Planck Institute for Extraterrestrial Physics in Garching, Germany. The co-authors are Andy Fabian from Cambridge University in the UK; Eugene Churazov from the Max Planck Institute for Astrophysics in Garching, Germany; Alexander Schekochihin from University of Oxford in the UK; Aurora Simionescu from the Institute of Space and Astronautical Science in Sagamihara, Japan; Stephen Walker from Cambridge University in the UK and Norbert Werner from Stanford University in Stanford, CA. Coordinates (J2000) RA 12h 59m 48s | Dec +27° 58´ 00"
Are there any other clusters of galaxies with those arms? Are there any hot gas vestiges between the Milk way and Andromeda? Such beauty! These images are a marvelous human technological achievement at an awesome cosmological scale. A collection of thousands of galaxies, with long arms of hot gas. About 318 million light years from Earth. Combining X-rays from Chandra with optical data from SDSS. About 2 million light years. X-rays are pink, optical red, green and blue.